Advantages: Hi-Torque (270 kgf/cm), Ergonomic handle, Easy operation, Sturdy. The "Wizard" works like magic in the hand, Quicken Removal for One-hand operation as well as Ratchet (forward - reversible) Driving. 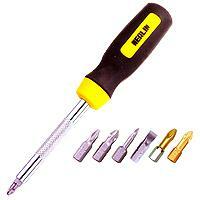 Ratcheting combined with Bit - Holder / Finder - Driver for bits and screws self retracts as screw penetrates wood. Swivel - Shaft for superior control when driving screws with excellent effciency and quality.